Quick Guides can be customized to suit your business and audience. Your logo or any other pertinent information can be added to any books. Quick Books provide essential information supporting your OH&S programs. 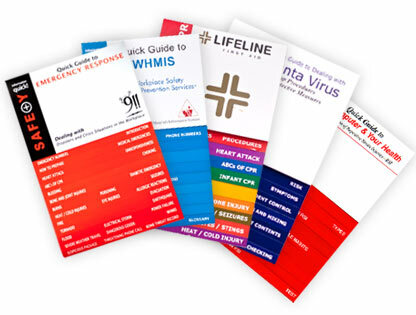 Emergency Response, First Aid and CPR, WHMIS, Hanta Virus, Vehicle Accident Checklist, Near Miss/Hazard Identification Form are some the current topics covered by these practical booklets. 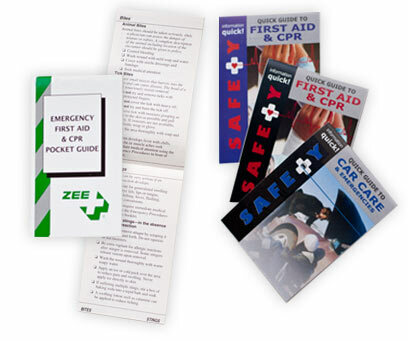 Manufacturers of first aid kits and other occupational health and safety products find the customized mini Quick Guide to First Aid and CPR to be a cost-effective, innovative marketing tool as well as an essential part of their product line. This title is available in French/English, Spanish English and a Care Care and Emergencies guide. Quick Books are perfect for value-added promotional items to reach targeted customers and the general public through direct mail, trade shows or point of purchase. Did you know...that Quick books can be customized to cover any topic you need? So, in addition to the titles in our price list, we can create a Quick Book to your specifications. 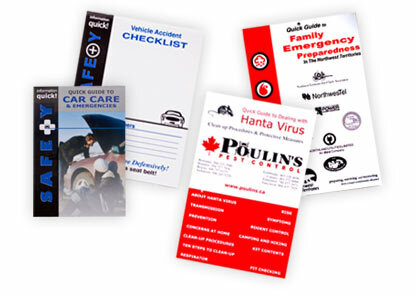 Directories, safety manuals, incident command system, record booklets or customer information booklets are just some of the custom booklets we have produced for companies like yours. If you have information you want to get out to your employees or customers in a concise, easy-to-reference way, a Quick Book is your answer. Leave the work to us. Our services include writing, editing, printing, production, and translation. Our promise is to provide outstanding customer service and to meet your current and future needs. 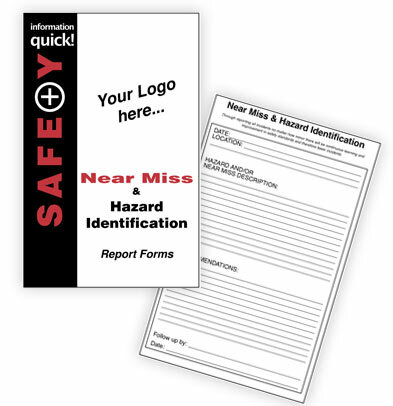 25 duplicate forms in each booklet to record workplace near-miss accidentsand hazards.